Traditionally, the migrant flow from Mexico to the United States has been concentrated in California, Texas, Arizona, and Chicago, but since the late 1980s, migrant settlements have been diversifying and expanding to new regions, such as New York City. Today, there are over half a million Mexicans residing in the Big Apple, a population that grew by 75% from 2000 to 2010.1 The first Mexicans to arrive in New York in this latest wave that began in the late 1980s came from the South Mixteca region, which covers parts of the states of Puebla, Guerrero, and Oaxaca. They were followed by Mixteco, Tlapaneco and Nahua indigenous peoples, along with mestizos from the mountains of Guerrero. In the 1990s, with the decline of the campesino life, the fall of coffee prices, and neoliberal policies such as the North American Free Trade Agreement (NAFTA), the campesinos and Otomíe, Nahua, and Tepehuas indigenous peoples from the West Sierra Madre of Veracruz similarly began to migrate to the city of skyscrapers, followed later by residents of other states like Morelos and Tlaxcala. Packets sent from Mexico to Queens. Photo by Cinthya Santos-Briones. Over time, the transnational life of the migrants became infused with nostalgia for the places left behind.2 Memories are central for social wellbeing and have been developed and promoted through everything that makes the migrants remember life in their old community: fiestas, music, food, and traditions. The ties between migrants and their families have also been reaffirmed and sustained by exchanging cultural products sent through an informal messenger system that has arisen within the community itself. The system is called a “personalized family packet service” (paquetería familiar personalizada) or, in English, a “courier” service. The couriers deliver packages, messages, and letters in a much safer, faster, and more personalized manner than ordinary mail services or the transnational messaging giants, such as DHL, FEDEX, and UPS. The messaging services that the couriers perform function not just internationally, but also on local and regional levels. The couriers create their own commercial routes between old and new migrant communities, not just between Mexico and the United States, but also throughout Latin America, the Caribbean, and even Africa. For over 25 years these couriers have dedicated themselves to personalizing the business of “express” mail between distinct communities and states of Mexico and the city of New York, transporting weekly what they call “the sentiments and emotions of nostalgia.” The couriers, also called paqueteros, ply their trade principally in major migration sites, such as New York, Chicago, Los Angeles, Atlanta, Texas, Connecticut, New Jersey, and Florida. There are over 500 couriers in the tri-state region alone, who work in different, often indigenous, areas of Mexico such as the southern Mixteca. They also serve Oaxacan populations of the mountains of Guerrero, and the Huasteca, Hidalguense, and Veracruzana communities in the states of Morelos and Tlaxcala. The courier services grew and strengthened after 1986, when the U.S. Congress passed the Immigration Reform and Control Act (IRCA), which legalized many Mexican immigrants who could then travel with greater frequency to their hometowns.3 The majority of the couriers began by sending packages to family members and friends, but over time their social networks began expanding in the transnational community space, and thus their market expanded. As the courier systems grew, the majority began to be represented by groups of workers in both Mexico and New York who would pick up and deliver the packages. Usually, the couriers travel once a week, leaving from JFK for Mexico City on Friday mornings and returning to New York on Monday nights. This schedule matches the market weekends, or tianguis, in Mexico, which enables family members to buy the traditional foods and products to send back to their family members in New York. From October to January, the work increases and sometimes couriers begin to travel up to twice a week. The cost of sending a package by courier varies by region, product, and personal connection, but generally costs from four to six dollars per pound. Generally, the families of the migrants use this service to send a variety of traditional foods, often grown in their own fields or gardens. Some women enjoy preparing itacate (a Nahuatl word meaning backpack, referring to food that is wrapped in a package) with some mole, along with tamales, tortillas, beans, and fresh salsa for their loved ones working on the “other side.” Other common food packages, depending on the region, are: fresh corn, beans, chiles, dough to make tortillas, sesame seeds, peanuts, coffee, corn husks, papatla (a leaf used to wrap and prepare traditional tamales), plantains, cuitlacoche, green beans, chayote, pinole, tlayudas, gorditas, tlacoyos, chocolate, cheese, candy, bread, and jams. Only a few foods such as eggs, fruit and meat are restricted at U.S. customs with a fine of over $300. The variety of food also depends on the time of year. For example, during the feast of Todos Santos or Day of the Dead, the families send food to be placed on the altar as offerings, and in the rainy season, they send charal fish tamales and acociles river shrimp. But, they do not only send food, but also love letters, religious objects, photographs, and videos of the feasts of patron saints, weddings, quinceañeras (15th birthdays), baptisms, carnivals, and school graduations. 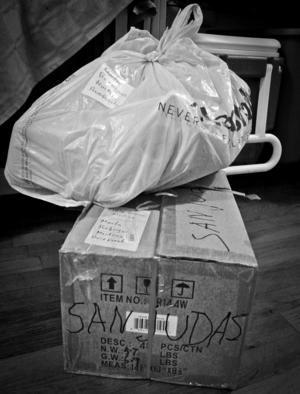 Merchandise flows equally from New York to Mexico, with migrants usually sending their families electronics, bicycles, clothes, and toys. The choice of gifts depends on the annual celebrations. For example, on Children’s day, Christmas, and Day of the Kings, the migrants send toys for their children. For Mother’s day and on February 14th, some couriers even offer the delivery of floral arrangements, such as in the case of the Huasteca veracruzana. The couriers are migrants too, and not exempt from the needs and struggles of their undocumented countrymen; they understand that their culture and business are part of the same idiosyncratic transnationalism. They are not just impersonal businesspeople who only receive and deliver merchandise; they are friends, family members, neighbors, and paisanos. “As couriers we are aware that we don’t transport things, but instead memories, nostalgias, sentiments,” comments César Romero. Facing these challenges, a group of couriers began to organize and in 2006 created the Mexican-American Association of Couriers of New York (AMAC) with approximately 400 members, with the objective of defending their rights as workers before customs and the airlines. AMAC began to hold monthly meetings to inform their members and keep them up to date on airline rules and regulations and their rights in customs. The AMAC group arose with the end goal of having the unity and power to work together and face the legal and customs problems in a bi-national manner, and to share the associated risks and information. In Mexico, there are no clear rules regarding what you can or cannot transport, which allows greater individual discipline and discrimination on the part of Mexican authorities. There is no Mexican judicial or government position overseeing the courier business. Thus there is no legal structure of protection and it is seen as an informal industry. That is, couriers in Mexico are seen as comparable to street sellers—as a part of the underground economy that the government has not wanted to legalize. Couriers are not well-received by customs authorities despite the fact that they pay taxes. In contrast, in other Latin American countries, such as Colombia and Ecuador—and in the United States—courier services are a regulated industry and legally protected. Even as the couriers legalize and unionize in the United States, they face continued challenges in Mexico. “In Mexico it is a bit difficult to ply this trade because it depends a lot on the mood of the customs authorities and on corruption,” Nicolás Torres, a courier for the Guerrero mountains, tells me. Furthermore, the couriers are vulnerable to economic changes and airline costs. But despite everything, the personalized package service that the couriers provide streamlines, strengthens, and reconstructs the social and economic ties, and above all strengthens the affective ties between migrants, their families, and their communities. The messengers are a meeting point that enables the physical and symbolic maintenance of emotional connections with a land left behind. Cinthya Santos-Briones is an ethnohistorian, anthropologist, and photographer. She has worked for Mexico's National Institute of Anthropology and History, and is a regular contributor to the Mexican daily paper La Jornada. Translated by Naomi Glassman.